Laundry/Storage Room Reorganization 1/2: I don't think I could be more pleased with this result! My client and I found a dresser in the home that was not being used and fit PERFECTLY into the cubby. Adding that piece as well as adding another shelf to the built-in unit has added so much more storage in this laundry room/storage area! This project took me and the client 3 hours to complete. Mudroom 1/2: This fun project even impressed the kids when they returned home from school! Mudroom 2/2: Each family member now has their own assigned bin! 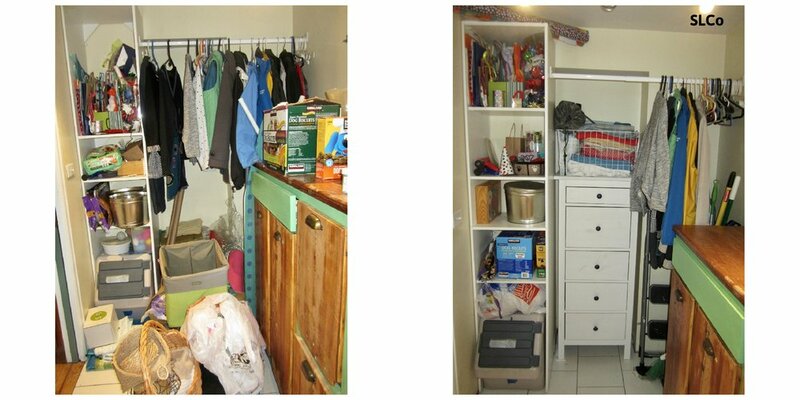 Laundry Room: This room serves as both the laundry room and kitchen storage overflow. The clients were quite pleased with the results! Under Stair Storage: The under-the-stairs storage in this house is now accessible and clutter free! Arvada Bookshelf: Bookshelves can hold more if you stack some books horizontally. And it’s pleasing to the eye to break up the flow! Denver Home Office Bookcases 1/2: Reorganizing the books allowed for all of the books to fit nicely and even left room to grow! Denver Home Office Bookcases 2/2: There were additional books in other piles (not pictured) in this office but after rearranging the shelves, all of books in the office now fit. Gift Wrap Storage: Now all of the gift wrapping items fit in these storage drawers! Arts & Crafts Bins: Now the boys know exactly where to find all of their arts and crafts items! Catch-All Drawer: This rehabilitated "junk" drawer is now much more functional for this family! Girl's Play Area 1/2: This project involved sorting toys and finding a place for everything so my client's daughter would know where to put her toys when she was finished playing. Hallway: Using the different racks for my client's sports equipment allowed for more storage availability in his closet. Streamlined Living brought in a handyman to properly install the sports racks. Utility Drawer: This was a true catch-all drawer, but now it's a useful utility drawer! Under Sink Cabinet 1/2: Adding the shelves doubled her storage space! Under Sink Cabinet 2/2: Big changes can be seen with a little sorting and containerizing! Catch-All Drawer: What a difference! Storage Area: My client and I went through 8 boxes of books. Many of them ended up in their bookshelves but even more of them ended up being donated! Hallway Bookshelf: The youngest child in this family of avid readers now has a special bookshelf just for her! Stacking some of the books horizontally is not only pleasing to the eye, but it also allows for more books to fit in the bookshelves. Storage Cupboard: With so many lights in the house, this client can now quickly locate what he's looking for the next time he changes a lightbulb. VRBO Conversion 2/3: Vacuum Space Saver bags work! Desk Area Catch-All Drawer: This drawer is now much more functional for this client!